TiePie engineering introduces the Handyprobe model HP2. It is the first 20 MHz measuring instrument connected to a PC that does not require an external power supply. This truly complies with the TiePie "Plug in and measure" motto. The Handyprobe HP2 is connected to the parallel printer port of the computer. 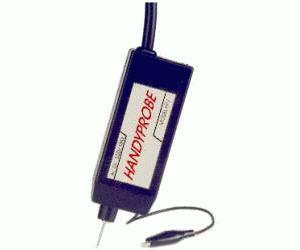 The 8 bit resolution, maximum sampling speed of 20 MHz, maximum recordlength of 64K samples and input range of 0.5 volt full scale to 400 volt full scale enable you to use the Handyprobe HP2 for all your measuring tasks. The versatile software that is delivered with the Handyprobe HP2 turns your PC into a storage oscilloscope, a spectrum analyzer, a voltmeter and a transient recorder. An intelligent auto setup allows the inexperienced user to perform measurements immediately. The software allows you to save instrument settings on disk. Later these setting files can be recalled, reducing the setup time of your instrument to an absolute minimum. Measured signals can be saved to disk, for later examination or reference. The extensive documentation features and the (color) hardcopy function are ideal for reporting.